UVA teas are from the picturesque tea gardens of Eastern Highlands of Sri Lanka, grown at around 3,000-5,000 feet above sea level. UVA region teas are renowned worldwide by tea connoisseurs for its smooth taste. UVA Basilur Tea tea bags are staple-free double chamber tea bags, produced using the latest machinery. Each tea bag is individually foil wrapped to retain freshness, with 2g per bag. 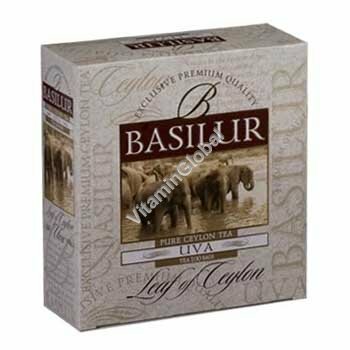 To make a cup of UVA Basilur Tea - place one bag into a cup. Add fresh boiling water and leave to infuse for 3-5 minutes. Add milk, sugar if desired.